Village Archive: 10 years ago. . .
A look back at what was happening around here in March 2006. 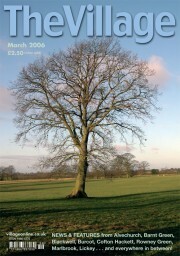 The oak tree on our March 2006 cover was photographed by Liz Holmes, whose work also featured inside the mag – she had volunteered to record the changing seasons for the UK Phenology Network. Hopwood villagers were stunned when Worcestershire County Council decided not to oppose plans for the Mayfield Farm rendering plant, leaving them with no official representation at the inquiry. Elsewhere, Lickey & Blackwell Parish Council had just launched its website, and The Village was running a photo competition for local youngsters. * The Weighbridge pub at Alvechurch Marina had been named Redditch & Bromsgrove CAMRA’s Pub of the Year – licencees John and Jayne Humphries had achieved the accolade in only four years as a pub, after the venue was converted from a private club. 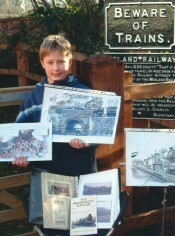 * It was 50 years since famous locomotive Big Bertha last assisted trains up the Lickey Incline to Blackwell, and archivists were appealing for memorabilia – adding to that displayed here by James Wood, whose grandfather Les was a fireman on Bertha in the 1950s.